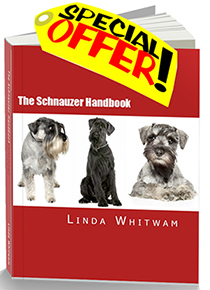 Are you looking for info on Schnauzer puppies? Whether you're getting a Giant, Standard or Miniature Schnauzer, you've come to the right place for independent advice to help you choose the right puppy to fit in with you and your lifestyle. Find a responsible breeder with a good reputation. See our section on Breeders for guidance. Take your time. Choosing a puppy which will share your home and your life for the next 10 to 15 years is an important decision. Don't rush it. You've picked a Schnauzer because of their size and temperament. You - like us - might also have allergies. Presumably you're planning on spending a lot of time with your new puppy, as all Schnauzers are "people" dogs and love being with humans. If you've chosen a Giant Schnauzer, then be sure you're prepared for lots of daily exercise as well! The next thing to remember is that while the breeds share many characteristics and temperament traits, Schnauzer puppies also have their own individual characters, just like humans do. Are you fit and active - do you want a lively, energetic dog? Or are you older and maybe live alone? If so, a more placid Schnauzer will suit you better. If possible, try and visit the puppy at the breeder's more than once. This will give you an idea of the puppy's character in comparison to his or her littermates. Some Schnauzer puppies will run up to greet you, pull at your shoelaces and playfully bite your fingers. Others will be more content to stay in the basket sleeping. Watch their behavior and energy levels. Which puppy will be suitable? A submissive dog will by nature be more passive, less energetic and also possibly easier to train. A dominant dog will usually be more energetic and sparkier. They may also need a firmer hand when training or socializing with other dogs. There is no good or bad, it's a question of which type of character will best suit you and your lifestyle. Roll the Schnauzer puppy gently on to his or her back in the crook of your arm (or on the floor). Then rest a hand on the pup's chest and look into his eyes for a few seconds. If he immediately struggles to get free, he is considered to be dominant. A puppy that doesn't struggle but is happy to stay on his or her back has a more submissive character. A similar test is the suspension test. Gently lift the puppy at arm's length under the armpits for a few seconds while allowing his hind legs to dangle free. A dominant pup will kick and struggle to get free. A puppy that is happy to remain dangling is more submissive. Watch how he interacts with other Schnauzer puppies in the litter. Does he try and dominate them, does he walk away from them or is he happy to play with his littermates? This may give you an idea of how easy it will be to socialize him with other dogs. After having contact with the puppy, does he want to follow you or walk away from you? Not following may mean he has a more independent nature. If you throw something for the puppy is he happy to retrieve it for you or does he ignore it? This may measure their willingness to work with humans. If you drop a bunch of keys behind the Schnauzer puppy, does he act normally or does he flinch and jump away? The latter may be an indication of a timid or nervous disposition. (Max is frightened of loud noises but is lively and playful in other ways). Not reacting could also be a sign of deafness. Decide which type of temperament would fit in with you or your family and the rest is up to you! A Schnauzer that has constant positive interactions with people and other animals during the first 3 to 4 months of life will be a more stable, happier dog. In contrast, a puppy plucked from its family and isolated at home alone for weeks will be less happy, less socialized and may well have behavior problems later. Puppies are like children. Being properly raised contributes to their confidence, sociability, stability and intellectual development.